I brought the cg to watch this very interesting movie which I have been waiting for a long time. It's called 'The Bucket List'. To make the long story short, it's about this two guys who found that their days are numbered, and decided to complete a list of things they wanted to do before they 'kick the bucket'. Hence the title. The ending was a touching one, one which I was moved to tears, although I have already known the ending. 2. Have your life brought joy to other's life? This is newater. You dare to drink? 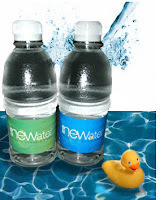 I have heard a lot of comments about newater. Some of my friends saw it as sewage water. I saw myself in it. Why? NEWater is clean water, engineered from sewage water through reverse osmosis. It is clean, unlike its past. As for me, I'm aware of the fact that I am a sinner, my sins and my past only washed clean by the blood of Christ. So I see the NEWater as a mirror of my Christian self.